The newest challenge is to unscramble the word PINKALICIOUS to make three or four words to use in or on the project. 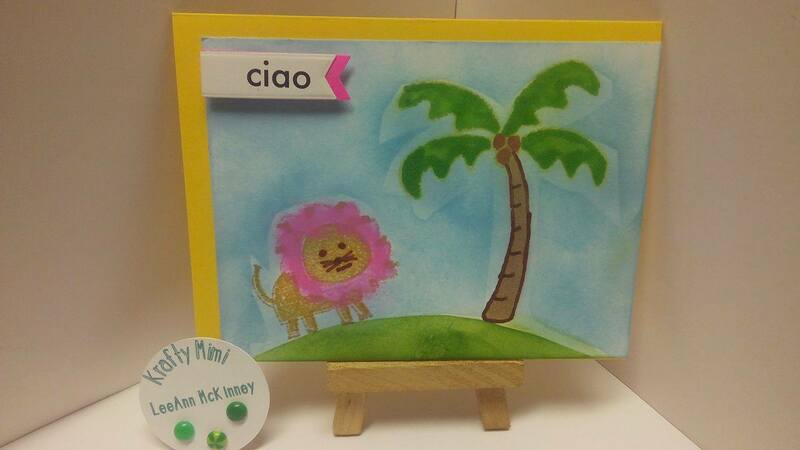 SO... here we go Pink of course, Lion, Ink, and CIAO... I really had fun with this one. Using a 3 step build a lion stamp from Stampology and GinaK honey mustard ink stamped the first layer, second layer with Tim Holtz tea dye, and the final AMuse bubblegum. The palm tree is from Hero Arts stamped with GinaK dark chocolate and AMuse grass inks. I then used contact paper to mask of the top so I could use mowed lawn for the grassy mound. Another section of contact paper was used to mask off the lion and tree while I used tumbled glass for the sky area. After removing the contact paper I went back in to fill in sections with the inks that were missed, this also created somewhat of a shadow effect. I then put the final touch on with CIAO, this little piece is from a card making package I received on my birthday cruise this year, during the cardmaking class that my friend and I were the only ones to show up to. I used a project life die to cut out the banner piece, the pink layer is a post-it note that I also used the banner die to cut. Hope you enjoy the first creation of the day.